A new film explores the Irish journalist’s crusade against doping in cycling, his relationship with Lance Armstrong and more. A still from 'Rough Rider'. IN THE UPCOMING documentary, Rough Rider, about Irish journalist and whistleblower Paul Kimmage set to be screened on RTÉ One on 28 July, there are two Paul Kimmages that emerge. On the one hand, there is the cerebral, uncompromising and unapologetically blunt individual eager to expose the cynics and doping apologists who have heavily contributed to the sport’s inextricable links with corruption for so long. Conversely, we also see the softer side of Kimmage. The family man who still feels “like a little kid” when watching the Tour de France. Kimmage loves and loathes the world of pro cycling in equal measure — a point that is very much hammered home in the new work directed by Irish filmmaker Adrian McCarthy. “I knew a little bit about Paul and I was very interested to know about his journey to date as such an outsider, a whistleblower,” McCarthy tells TheScore.ie. “As somebody who had cycled himself as a pro, he knew what he was talking about. The first part of the documentary takes a look at Kimmage’s background — how he fell in love with cycling and cultivated a bittersweet career in the sport, before establishing a reputation as a controversial journalist intent on exposing all its ills. Following this concise snapshot of his rise to fame (or perhaps infamy), the film then takes us to last year’s Tour de France, following Kimmage as he observes proceedings through a journalist’s gaze and asks difficult questions about the state of cycling following USADA’s game-changing revelations. One of the most challenging aspects of this somewhat improvisational style of filmmaking, McCarthy says, is of course that both Kimmage and his crew had little idea what obstacles lay ahead of them. “We didn’t know that there was going to be legal issues with him and the UCI. We didn’t know that was going to happen. And a good chunk of those things happened before we had any funding in place at all. Moreover, the issue of funding the film was similarly precarious. “Initially, we got some development funding from the Irish Film Board, which was great. It wasn’t a lot of money, but it allowed us to start filming some bits and pieces, and we also got funding from RTÉ. But one of the problems with this job is that we have never had enough funding to make this documentary. Therefore, through it, we’ve always had to pull in a lot of favours from people and ask the crew to either work for nothing, or close to nothing, or half their rates. However, while cash was not exactly free-flowing, McCarthy and his colleagues compensated for these issues through a sheer passion for and belief in the project. And notwithstanding the film being primarily about Kimmage and his fight against the liars and the dopers that have tarnished the image of professional cycling over the years, it is by no means a glowing tribute to him. Although McCarthy says Kimmage was happy with the finished product because “he feels it captures him,” the 52-year-old journalist had no say in the creative direction of the film. Furthermore, while Kimmage’s wife, father and brother all feature at various points in the documentary, unanimously issuing their support for the work he’s undertaken in the process, people who he’s on less friendlier terms with also give their side of the story, including former Irish pro cyclist and Tour de France winner Stephen Roche. The pair famously fell out after a controversial Late Late Show interview, in which Kimmage was reluctant to answer questions about the venerated cyclist, who he had grown up alongside and at one point effectively idolised. Yet despite his strained relationship with Kimmage, Roche was more than happy to contribute to the documentary. “When I did track him down, I explained what I was doing, and we spoke about the fact that their friendship isn’t great, they don’t really talk. Perhaps it would have been easier for him to say ‘thanks but no thanks,’ but he agreed to do it and we filmed him one of the days at the Tour. I admire and respect him for doing that, because he didn’t have to as he knew what the documentary is about. Yet one person who isn’t as prominent as some people might expect is Lance Armstrong — the disgraced American cyclist who was exposed partially thanks to journalism undertaken by Kimmage among others. Yet while Armstrong was the most famous person to invoke Kimmage’s wrath, he was by no means the first or the last. As McCarthy concisely puts it, there’s a “bit of that marmite thing to him”. This list of enemies includes other journalists, some of whom, as McCarthy bluntly puts it, “don’t like him,” owing to his willingness to criticise them publicly and their supposed failure to live up to the high standards he expects of both himself and others. In addition, even McCarthy and his film crew at times bore the brunt of Kimmage’s frustration. “We had our moments, which is not unusual, just because of the pressure we were all under. I was doubling up as a director and a sound man. We had Tony Whelan, who was the producer and also the driver, and did other stuff. And Ronan Fox who doubled up as cameraman and driver. Every night when you finish work, you’ve got hours more work to do because you’re copying across all the footage, getting it ready for tomorrow. And at six o’clock in the morning, you’re on the road again driving for another two hours. “But one of the reasons I find Paul very interesting is that he shoots from the hip. That’s not going to suit a lot of people, a lot of the time. One thing you get from the story is that friendships have been lost between former colleagues. “He speaks his mind and that’s what makes it interesting. He calls it as he sees it. One of the things, more and more so in today’s world, is that people hold back… He’s very passionate. Yet there are instances in the film where, behind this ostensibly intimidating persona, there is a determined humanist obsessed with retaining the purity of cycling and ensuring there are no more tragedies. 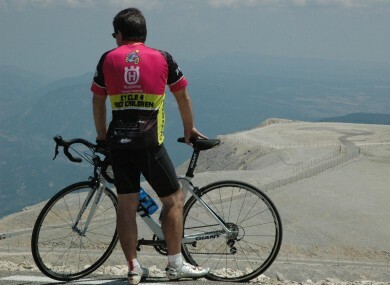 There is thus one particularly pertinent moment, where Kimmage visits Mont Ventoux — the site of the death of British cyclist Tom Simpson during the 1967 Tour de France. “He’s talking about the Simpson memorial and all those young guys who have died from what was rumoured to be EPO. I thought it was a very powerful moment because it gave an insight into what was going on — the bigger picture. A lot of the younger guys had lost their lives to the sport. Email “‘I was taken by the fact that he's such an outsider’ - Adrian McCarthy on his upcoming Paul Kimmage film”. Feedback on “‘I was taken by the fact that he's such an outsider’ - Adrian McCarthy on his upcoming Paul Kimmage film”.